Konstantin Chaykin is a watchmaker who has faced more challenges than most. Being a native of Saint Petersburg, his access to the formal routes towards the profession he would come to master was anything but straightforward. With no local heroes to emulate, Chaykin is self educated and perhaps that’s one of the reasons that time and again, his watches are so innovative and unconventional, but always extraordinary showcases of the philosophies of horology. Now firmly established in his Moscow atelier, Konstantin Chaykin is recognised as one of the most prodigious talents in modern watchmaking, as well as being current President of the AHCI. For his Hijra masterpiece, Konstantin Chaykin has conceived and created a remarkable complete calendar, which features day, date, month and moonphase, but with a reimagined mechanism designed to operate around the Islamic calendar, which rather than using the solar year of 365 days, instead takes twelve lunar cycles as its basis, eleven days shorter than the Gregorian calendar. On the dial, the theme of Islam is reflected in the many little details such as the elaborate hour and minute hands which depict a mosque and a minaret. All numerals are printed onto the different displays in Arabic, where the weekday and month are found at the twelve and the six respectively, with the outer flange for the date which is indicated by a crescent moon on a thin hand. Just as the moon is fundamental to the Islamic calendar, so it is with Hijra too, and just above the centre the moonphase is displayed in an ornate aperture. The Hijra is encased in a 42mm case of polished stainless steel which has a water resistance rating of 30m. Underneath a sapphire caseback reveals the in house designed and manufactured KJH 01-2 hand winding movement, with Côtes de Genève stripes and on the ratchet wheel, an eight pointed star which has Islamic symbolism. The Hijra by Konstantin Chaykin is a superb piece in every way. 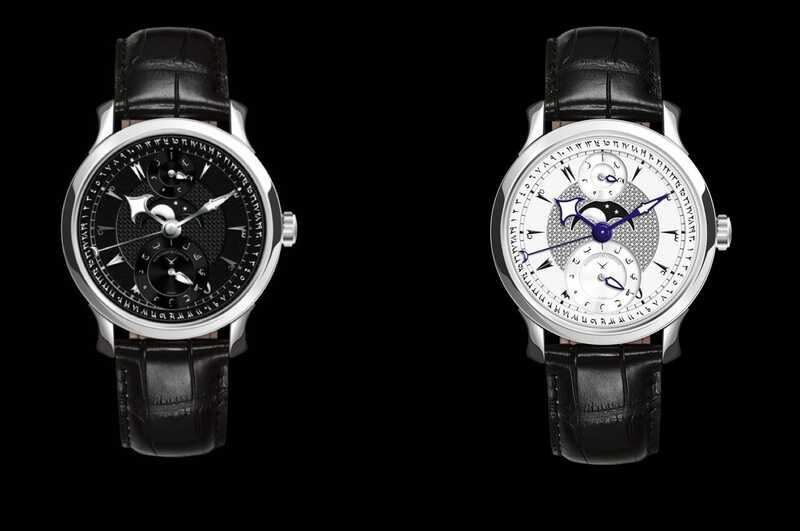 From its concept to its execution, it demonstrates a master who embraces challenge and who can apply his unique talent in much the same way as the pioneers of horology would have done. It is presented on a black alligator leather strap and is available with the option of black or silver dials.